(Newser) – Silas Johnson recently entered the world through emergency cesarean section at Cedars-Sinai Medical Center in Los Angeles, but what makes his case truly extraordinary is that he was born at 26 weeks with his amniotic sac still perfectly intact around him, holding the placenta and umbilical cord as well, reports KHON2. "It was a moment that really did, even though it's a cliche, [make us catch] our breath," says neonatologist William Binder. "It really felt like a moment of awe." Mom Chelsea Philips had no idea until her mom showed her a picture later. "He was kind of in a fetal position and you could see like his arms and his legs curled up," she says. "It was actually really cool to see, and when I heard that was actually really rare, I was like, oh my gosh, you're a special little baby." Only "rare" in our culture now because of routine AROM (artificial rupture of membranes) during labor or C-section - of my 3 babies, the two that didn't have their "waters broken" intentionally during labor were both born in the sac. While getting to see and photograph this was a rare event for a surgical team, that fact says much more about the medicalized culture of birth and the skills of that surgeon than it does about this particular baby. 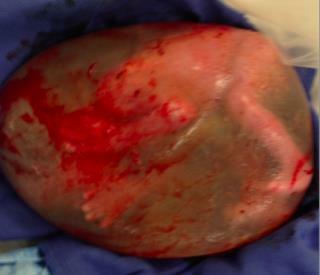 My daughter was born at 26 weeks and in her intact sac through natural childbirth 27 years ago. I just didn't know it was a rare thing at the time. Now I wish I had been able to get a picture of her in sac! Though at that time none of us were thinking of something like that. We were to busy with her brother being born to think of it.